I might be the only person EVER to make a unicorn card in black and white. Without a rainbow of color. Because, unicorns and rainbows, right? Well, this one….this one has a crazy story inside my head about a unicorn coming home after a long day at work as a unicorn….and, well. You just have to watch it. LOL. Watch the video below or click HERE to see it in HD on YouTube. 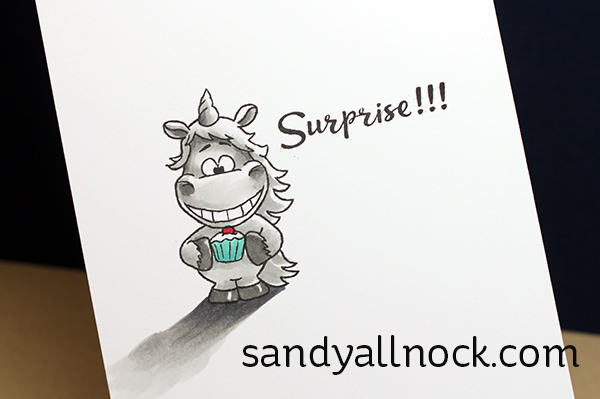 And of course the inside of the card has the “SURPRISE!” inside….and I let a little tiny bit of color loose on the cupcake! Sandy, your talent is just so amazing. This card is definitely one of my favorites! You ROCKED it!!! You have a great imagination. Although I do agree that they would have rainbow paintings and parties at night. Wow! I really love this card! I’m just blown away by your technique! WOW, that was amazing to watch as it came together! Wonderful job Sandy! What an adorable idea. LOVE it!!! You have outdone yourself. So darn cute! Love it! Did you ever think about selling tickets to your dreams at night? I’ll buy one. a funny card – we need more of them but a grey funny card is pure delight! Amazing! I love how detailed this card is using only grays! So awesome!!! It looks amazing and I love the back story!!! Way to funny!!! Mind blown! So creative!! LOVE this fun story behind it. Amazing colouring as always. This is amazing! I love the whole idea of this card, you have a great imagination and talent. I had to pop in to tell you,this is my most favorite card all year.Sandy you have the most amazing depth creating shadow and depth for that matter.Simply perfect. All by itself a surprise unicorn card would be awesome. But then turn it into a surprise party. And then mask off a bunch of giddy unicorns, and then draw in the incredible background, and then do it all in grays!!! You are one crazy, creative, talented lady! Sooooo cool! I love to watch you creating all these beautiful backgrounds to your scenes! What a great idea with the black and white card – love it! I just watched the video and had to visit your blog to take a look at the photos. You make so beautiful scenes! 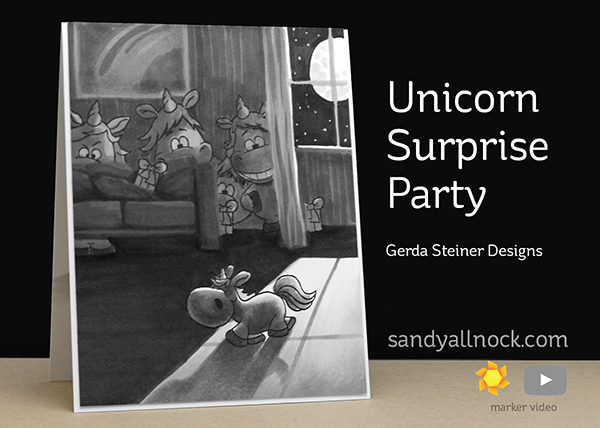 The unicorns all in gray! It totally fits! I’m speechless, you have an amazing talent! Thanks for sharing it. Pretty cool! I’d get a great big chuckle if somebody sent me a black & white unicorn card – and I’d keep it a long time, just because it’s so different and funny!